Chaos Creation’s third promo carried on the beefcaked direction of Psyched-Out Manipulation with some yummily pulverizing results. The production is stellar for a demo, I’d dare say, and I especially enjoy the lethal snap of the bass drum. The guitars are crunchy, bass pounding mightily and the vocals are well balanced to fit the different points. Up high in the mix in verses and choruses, and slightly down-played and ominous when acting as an atmospheric element. The vocals got quite nice indeed, as singer Triple A was molding into his own style quite well. His shout could still use some more power – a little more gruffness too, perhaps – but his cynical snarl fills the tone with much personality. I’d say the sarcastic feeling he is going for reminds me of the master of sung, “f*cking-with-your-head” sarcasm, Jethro Tull’s Ian Andersson, although the musical stylings bare very little resemblance. A very familiar piece of movie monologue, courtesy of the wonderfully maniacal Jack Nicholson in Batman, acts as a very appropriate intro to Obsessive/Submissive, a brilliant slice of thrashy goodness. Lead guitarist Mikko Knuutila rips it up with the solos and unhinged moshing cannot be stopped. These factors can also be said of the hard rock-vibed Shining Wizard, which I can bet is a veiled tribute at the beautiful pro wrestling manoeuvre perfected by Japanese legend The Great Muta. The short instrumental Ghost sticks out as a bit dull on its own, but it is a very effective lead-off into Corpsepaint Cavalry. This speedy, (damn, those double bass-flurries are awesome) pit-spinning gem has some mighty interesting lyrics, depicting the tr00-evil-kvlt-fringes of metal (especially of the black variety) in a very parodying light. All in good humour, I trust. The riff-grinding of Toni Huhtiniemi is absolute devastation. Anyone thinking the song gets quick with the first verse, should just wait for the solo section, when heads start flying. An excellent finalizer for Homicidal Party Time, a very admirable piece of work. Unfortunately for the rapid improvement in the band’s ability and sound, three fifths of the line-up on this promo (singer Triple A, guitarist Knuutila and drummer Vesander) left the permanent line-up due to other projects absorbing the time. 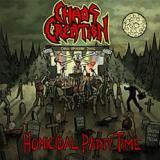 Chaos Creation has since regrouped well, although still searching for a permanent drummer. They just recently finalized their fourth promo, which according to the band, will be their last of the sort. After that (of which a review is forth-coming) they will head to make a full-length album, with or without the backing of a record label. For musicians of this calibre and talent, that is the only goal to go for. Hopefully some industry-bloke takes note.